1) Cut the beef into palm sized pieces. 2) Bring a pan to medium heat, add olive oil and brown beef in oil on all sides. 3) Put the beef in a pressure cooker (or large pot; it will just take a lot longer to cook) along with the rest of the ingredients. 4) Bring pressure cooker to pressure on high heat; then cook for 35 to 40 minutes. 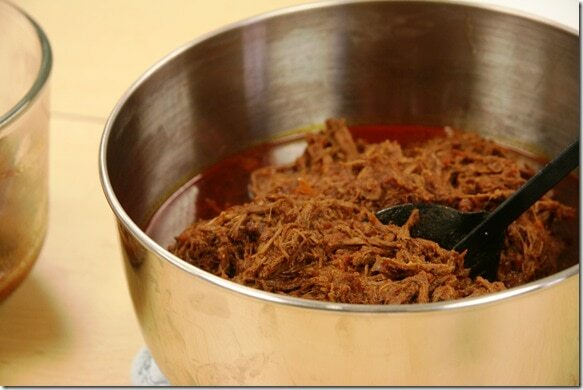 (If you’re using a regular pot, you will need to cook for a few hours — or until the beef is soft enough to easily shred). 5) Remove meat from pot and shred it using a fork (should be very easy to do), then add it back into the pot and stir. 6) The beef should now look like a wet mop Feel free to add more liquid or cook it longer with the lid off to boil off some of the liquid, depending on your preference. Click here for the original post with LOTS more photos of the fun food science lab class I learned this recipe during!